ครูเซ็ท น้ำยาย้อมผมชนิดแชมพู ควิกแอนด์อีซี่ 45 มล. 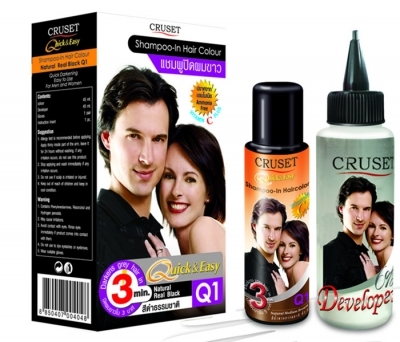 RUSET Quick & Easy Shampoo-In Hair Colour 45 ml. Create new character. Instantly cover grey hair within 3 minutes. The Special formula for new generation, working or executive persons who have short time for confidently make hair style. Just apply CRUSET QUICK & EASY on hair and leave for 3 minutes then wash out. Not only new hair's colour will instantly appear, also entirely cover grey hair. Give you soft, strong and healthy hair as well as ready for hair styling.